UPDATE 18th April: We are no longer accepting any entries for the Llandow Sprint 2019 as the maximum number of entries and reserves has now been reached. Final Instructions and entry list will be sent out in early May. If you have any questions about the event please email Zoë Tooth, Event Secretary – tooth.zoe@gmail.com. The current list of confirmed entries and reserves for the event are in the downloads section. 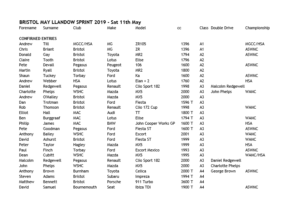 The 2019 May Llandow Sprint will again be co-promoted by Bristol Motor Club and Bristol Pegasus Motor Club. The event is a round of The Trident Engineering WSH Championship and the 2019 TyreMarks ASWMC Sprint Championship, as well as the DEWS Speed Championship, the Vincenzo & Son Bristol MX5 Challenge, the SBD HSA Speed Championship 2019, the HRCR Moran Motorhomes Speed Series 2019 and the MGCC Speed Championship. We are also pleased to welcome members of the co-promoting clubs and also remind competitors that the event is open to members of any club affiliated with the WAMC, the ASWMC or the Cotswold Motor Sports Group. For all competitors who have previously entered the event we welcome you back, for those competitors who are entering this event for the first time we warmly welcome you and trust you will find the day to be enjoyable and competitive. It is now also possible to enter online and pay by cheque. However please ensure that the Cheque option is selected in Method of Payment question. Cheque must be posted to the Entries Secretary. Details of all payment information/address will be contained in the confirmation email sent to you after submitting the online form. Overnight parking is not allowed at the venue. For overnight facilities there is camping at the Llandow caravan and camping site (next to the circuit) please make your own arrangements. Llandow Caravan Park, Llandow, Cowbridge Tel: 01446 794527.